In the more developed countries, people probably take trains for granted. After all, spending hours everyday on trains going to and from work can easily get one immune to the surroundings. It’s just a matter of convenience, really. More so, with all the mobile gadgets that most people have today (not to mention connectivity practically anywhere you may be), the train’s features may be the last thing that you pay attention to during your daily commute. In Tokyo, however, the trains have just undergone an upgrade that will get the attention of even the most jaded of people: lightsaber railings. Anyone who has been on a train (no matter whether it’s high speed or not – not all of us have high tech bullet trains that the Japanese have anyway) would know that those handrails in trains can save one’s life. Or at least save one from a lot of embarrassment. However ugly the railings in a train may be, I would still hang on to one for dear life. But if the railings on every train looked like the new ones in some of Tokyo’s trains, then I suppose everyone would be grabbing them even more. Or have one hand free to take pictures. 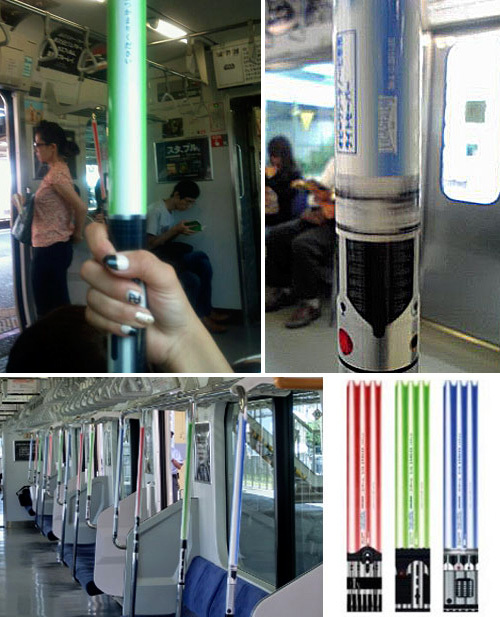 The new lightsaber railings don’t only look like lightsabers from Star Wars, but they also function as well – somehow. With a flick of a switch, the lightsaber railings glow nicely, almost like the lightsabers that we see in the movies. The lightsaber railings have three colors – red, green, and blue. There is, of course, no guarantee that you can hang on to the railing with your color of choice. With millions of people using the Tokyo train system everyday, you are bound to get caught in a crowd. What did they do to create the lightsaber railings? The technology – if you can call it that – is rather simple. With a little creativity and the use of decals, the ordinary railings were presented in a new light. Two things I am sure of. One, we will get to see more photos and videos of the lightsaber railings in action. Two, Star Wars fans from all over the world are wishing that their own trains had similar railings.